I keep hearing that there are 365 “don’t be afraids” in the Bible, one for each day of the year. I haven’t been able to find them all but there are a lot of them even though there might not be 365. The reason we should not be afraid is most often because God promises to be with us in our trials. The opposite of don’t be afraid is “be strong and courageous.” What should inspire strength and courage? Notice Joshua 1:9, “This is my command—be strong and courageous! Do not be afraid or discouraged. For the LORD your God is with you wherever you go.” It really is God’s promise of His presence in all our trials and all of our challenges. He will not desert us or betray us. What sustains us through life’s struggles is our faith that there is a God and that He loves us and is with us through all our pain. Yet there are times in my life, and I’m sure there are some in your life, when it appears God’s not around or that He has left us to fend for ourselves. We all have sorrows and we all suffer and we all get sick and of course the normal ups and downs of life are shared by us all. God doesn’t promise us a rose garden as one singer puts it. Jesus told us there will be trouble in this life. But He also assures us that He has overcome the world. Just the fact that God tells us “don’t be afraid” is ominous in and of itself. That exhortation is always a prelude to something that’s going to happen to arouse fear in us. Ryken illustrated this truth, “It is like the king who sent one of his knights off to rescue his fair princess. Just as the knight rode away from the castle, and just as the drawbridge was closing behind him, the king yelled down from the ramparts, ‘Don’t be afraid of the dragon!’ ‘Dragon? What dragon? You didn’t say anything about dragons!’” No matter what dragon you may be facing today or in 2015, please know that God has promised to be with you through it all! 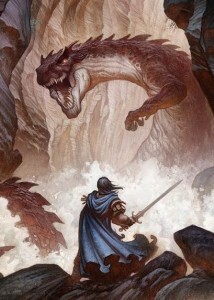 With faith in God’s promise we can all be dragon slayers.